Since I’ve been all about secret ingredients lately (chickpea muffins, anyone? ), I figured I’d stick with the trend and post another delicious recipe containing an unlikely ingredient. After undergoing a gingival graft last week (in which a piece of soft tissue from the roof of my mouth was sliced off and sewn onto the gum line of my two front bottom teeth to counteract some recession most likely caused by my orthodontic work in middle school…for those of you who care to know), basically all I’ve been able to eat is yogurt, scrambled eggs, and smoothies. Well, and because I’m me, I’ve been eating blended-up overnight oats, mashed-up turkey meatloaf mixed with zucchini puree, and smashed-up avocado/shredded chicken salad. Hey, I’ve got to keep it interesting! Anyway, lately my best friends have been soft, cold foods to ease my aching mouth. And what better best friend is there than chocolate pudding? I’ll tell you what: chocolate avocado pudding! It’s rich, smooth, chocolatey, full of heart-healthy fats, and doesn’t taste at all like avocados. At least, I don’t think it does–if you have sensitive taste buds, you might be able to detect a slight avocado-y taste, but the dominant flavor is definitely chocolate. Pure, smooth chocolate. Gahhh. Not only is this pudding (fairly) healthy, easy, and delicious, but it only takes about 5 minutes to whip up! I highly recommend chilling it for 30 minutes or so, but if you’re feeling impatient you can eat it right then and there. I wouldn’t blame you. Most of the measurements here are just ballpark figures–feel free to add more or less of the cocoa powder, milk, and sweetener until you reach your desired taste and texture. If you like your pudding a little more creamy and a little less intense, add a few extra tablespoons of milk. If you want a super-chocolatey flavor, add a bit more cocoa powder. If you’re trying to cut back on sugar, just use a tablespoon or two of agave or honey. Unlike delicate pastries or baked goods that require exact measurements, this recipe is highly adaptable and pretty darn hard to mess up. In the past I’ve thrown in a banana, left out the milk entirely, added peanut butter, and doubled (okay, tripled) the entire recipe. Each and every time, it was delicious. Even if you’re not usually an avocado fan, I urge you to blend yourself up some Secret Ingredient Chocolate Pudding! It’s the ideal comfort food whether you’re recovering from a dental surgery like me, or just want to enjoy a no-bake dessert on a warm summer night. Have fun experimenting–and eating! Scoop out the avocado flesh into a food processor or blender. Add the rest of the ingredients and blend or process until very smooth. Spoon into bowls or small ramekins and chill for 30-60 minutes before serving. Note: this pudding should be served the day it is made for the best texture and flavor! I’m sitting here in shorts and a tank top, the thermometer reads 78.4 degrees, and I have an awesome tan line on my neck/shoulder from wearing a side ponytail all day while out in the sun (<—fail). So basically, for all us Pacific Northwest wussies, it’s a sweltering summer day. Sorry if you happen to live in Phoenix or something and would give up an arm and a leg to have a 78.4-degree day right about now, but up here in the land of clouds and drizzle we consider this a hot day indeed. Or at least I do. But I still love it! Even though I really do enjoy the warmer weather, it certainly doesn’t make me too excited to turn on the oven for a baking project in the middle of the day. 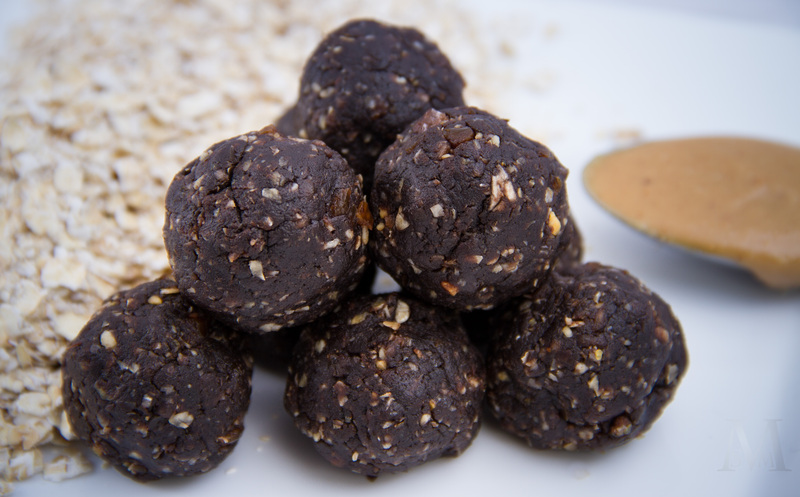 Instead I turn toward no-bake desserts like these awesome little energy bites. The good news about these treats is that they aren’t full of fat and sugar to weigh you down. They’re made with a super short list of fresh, healthy ingredients and are gluten-free, vegan, and contain only natural sugars. 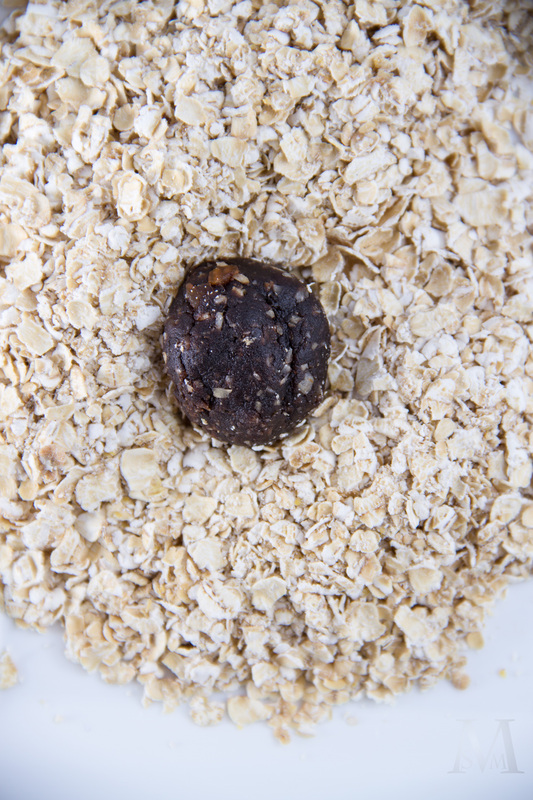 (If you’re making them gluten-free, be sure to use gf oats!) You do need a food processor for these, but if you don’t have one don’t worry. 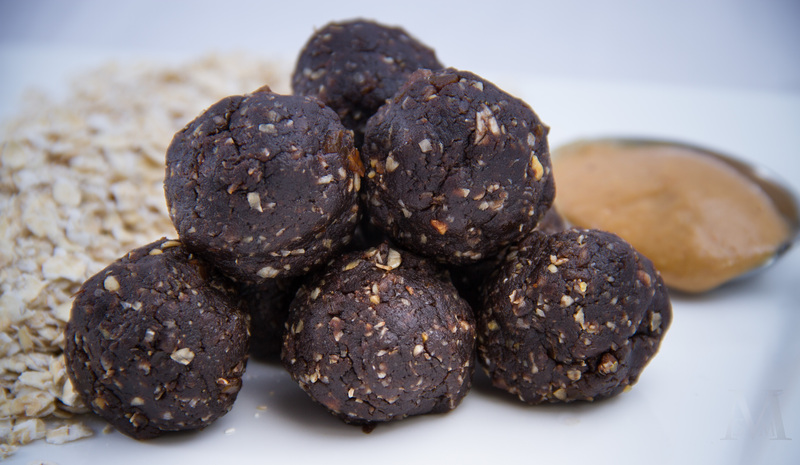 Just try these other wonderful energy balls instead! My family went nuts over these cookie-dough-like bites. They’re perfect as an after-dinner treat or as a little snack to pick you up from an afternoon slump. You could even grab a few for breakfast! I love how in a matter of minutes I can be eating these delicious, nutritious little balls in a house that hasn’t turned into a sauna from a 350-degree oven. 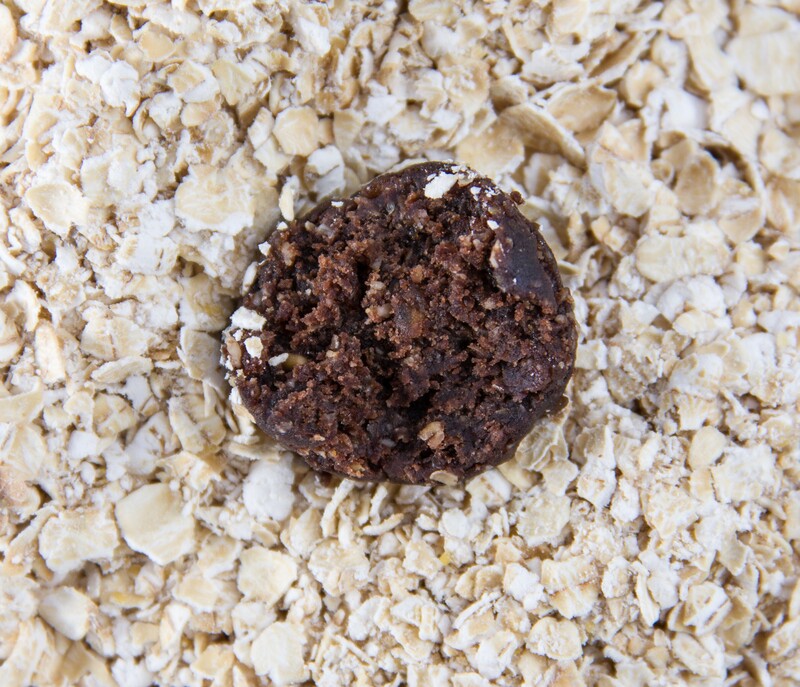 It’s almost like eating chunks of oatmeal-chocolate-peanut butter cookie dough, but the ingredients are actually good for you…summer eating at its finest! In a food processor, combine all ingredients except for the water. Process until the mixture clumps together. Add in the water and pulse until incorporated. Pinch off pieces of the mixture and form into small balls (I ended up with about 2 dozen). Roll in shredded coconut, chocolate chips, or cocoa powder if desired. Store the bites in the refrigerator. I’d like to thank Fae of Fae’s Twist and Tango for nominating me for the Super Sweet Blogging Award! It’s such a treat (no pun intended) to be recognized by other bloggers, and now I get to nominate thirteen blogs myself! 1. Cookies or Cake? Cake, please! 2. Chocolate or Vanilla? Vanilla! 3. What is your favorite sweet treat? Anything with cookie dough! 4. When do you crave sweet things the most? Usually after dinner. 5. If you had a sweet nickname, what would it be? I have absolutely no idea! Susanna, Kristin, Lindsay, and Jennifer from Mrs. and the Misc. 1. Visit and thank the blogger who nominated you. 2. Acknowledge that blogger on your blog with a link to theirs. 3. Answer the “Super Sweet” questions. 4. Nominate a “Baker’s Dozen” (13) blogs for the award, including a link to their blogs in your post, and notify them on their blogs. 5. Copy & paste the award onto your blog. Today’s post is dedicated to everyone affected by the shooting at Sandy Hook Elementary School. I had plans to write a bright, cheerful, humorous post as Christmas draws nearer, but it doesn’t feel right after such a devastating event. The pain, shock, and heartache that the people of Newtown, Connecticut are surely feeling right now is unfathomable. My heart goes out to all the families in Newtown who have lost a child, lost a friend, or just borne witness to this horror. It’s tragedies like these that make me so sad about the world and unable to understand how a human being can be capable of such an act. Murder in itself is horrible, but something about the innocence of a child makes it all the more heart-wrenching. We live in a world that isn’t all sunshine and daisies; there is sadness that I can’t even begin to comprehend. It makes me so grateful for all the good things in my life that I often take for granted: a family who loves me, monthly paychecks, free education, a kitchen full of food. Chestnuts roasting on an open fire, Jack Frost nipping at your nose, quick homemade potpourri simmering on the stove….wait what? That’s right; the next thing to add to your list of holiday preparation is making a batch (or two, or ten) of this simple potpourri, which will make your house smell like the sweet, warm, spicy goodness of the holiday season. I’d never made potpourri before now, and I can’t believe what I’ve been missing! I had all the ingredients at home, it took me about 2 minutes to put together, and it simmered away for hours, making my house smell like Christmas! I can’t imagine how many other sumptuous potpourri combinations I could come up with…I’m thinking of trying some sort of lemon version or maybe using apple cider instead of water. Yum! If you’re looking for a quick, inexpensive gift for the holidays, consider putting together potpourri mixes. Just tie up an orange, cranberries, and the whole spices in a cute little bag with instructions and you’ll be good to go! I’ll be back soon with more delicious holiday recipes…since it’s still only November I’ve been trying super hard to hold back my enthusiasm for Christmas but it’s becoming more and more difficult…soon it’ll be like trying to hold back Niagara Falls with a Kleenex. It’s safe to say that I’m pretty into the holidays. <–Understatement of the year. In the meantime, start off the season by filling your house with the delicious smell of potpourri. Whether you celebrate Christmas, Hanukkah, or any other occasion, this fruity, spicy scent will be sure to get you into the holiday spirit! Pour 2 cups of water in a medium saucepan. Add in orange peel, cranberries, spices, and vanilla. Turn up heat to medium, bring mixture to a boil, and reduce to a low simmer. Simmer for as long as desired, refilling water every 30 minutes or so as it starts to evaporate. Potpourri can be re-used for up to 3 days or until it starts to lose its scent. 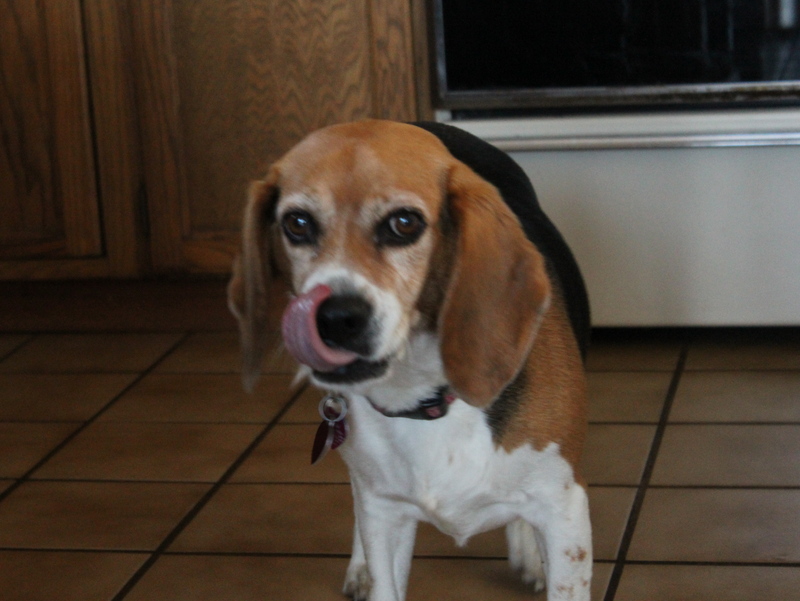 No, this post has nothing to do with Cleo, my beagle. I just thought that this expression encompassed what we’re all feeling right now, which is excitement about stuffing ourselves silly tomorrow! Although I think Cleo could do with a little reminder that Thanksgiving isn’t just about eating an obscene amount of food, but about taking time to celebrate all that we have to be thankful for. Like food, and walks, and soft blankets, and food, and new smells, and walks, and food, and tummy rubs, and animals to bark at, and food. Let’s just say that Cleo has a tiny bit of an obsession with all edible (and often inedible) objects that come within 100 yards of her hound-dog nose. I know it’s a little late, but I’ve put together a round-up of recipes that I think would be great for Thanksgiving. I tried to go with dishes that were a little out of the box and might be fun to add to your menu at the last minute, since I’m assuming most sane people have already planned what they’re cooking! Regardless of whether you’re hosting dinner at your house, visiting family, or even eating out, it’s never too late to whip up a little something extra to celebrate. I don’t think it’s possible to have too much food on Thanksgiving! I hope you all have a happy, safe, and DELICIOUS holiday! I was so excited to see that Fae of Fae’s Twist and Tango nominated me for the Liebster Blog Award! It’s such a great feeling to know that my blog is being read and appreciated. Thank you, thank you. I figured I might as well pass on that good feeling by nominating 11 bloggers of my own choosing, as well as answering the 11 questions given to me by Fae. 1. What inspires you? As far as my blog goes…family, friends, other bloggers, random recipes I see on magazine covers in the grocery store line. Not necessarily in that order. 2. What is your favorite dessert? Boy, that’s a tough one….but quite possibly Andes Mint ice cream cake. Yes, a pre-packaged sin for a baking blogger! 3. What is your favorite comedy? The Office! 4. When you were a child, what did you want to be when your grew up? Ironically enough, I’ve wanted to be a baker since I was about 5. 5. Why did you start a blog? I wanted to create a place to play around with writing, develop a voice, and keep track of all the recipes I try. 6. What is your favorite part of blogging? I love the feeling of accomplishment I get every time I publish another post, and the knowledge that I’m creating something totally unique. 7. What would be the name of your ‘reality show’ to describe your life? Honestly…no idea. 9. If you changed your name, what would you change it to? I wouldn’t change my name! 10. What is your dream career? Something in the field of writing …or maybe a child psychologist. 11. If money was no object, where would you live and why? I’d have two houses! One in the northwest, on the Pacific Ocean, and the other near my hometown in Colorado. 1) Why did you start a blog? 2) What is your favorite part about blogging? 3) Of all the posts you’ve written, do you have a favorite? 4) If you had a million dollars, what would you do with it? 5) What’s your favorite food? 6) If you could have a plane ticket to anywhere in the world, where would it be to? 7) Where would you like to be living in 10 years? 10) What’s one piece of advice you’d give to someone who’s thinking of starting a blog? 11) What’s one word that you would use to describe yourself? 1 Visit and thank the blogger who nominated you. 2 Acknowledge that blogger on your blog and link back. 3 Answer the 11 questions proposed by the person who nominated you. 4 Select 11 people for the award. 5 Pose 11 new questions to the new nominees.